Rich, flavorful, and bursting with sweet pumpkin and spice. Slather on the creamy frosting, and sink your teeth into a little slice of heaven. Pumpkin Bread with Cream Cheese Frosting is crisp on the outside, while moist and fluffy inside. Incredibly delicious, and easy to make, this is one crowd pleaser you’ll want to whip up again and again this holiday season. 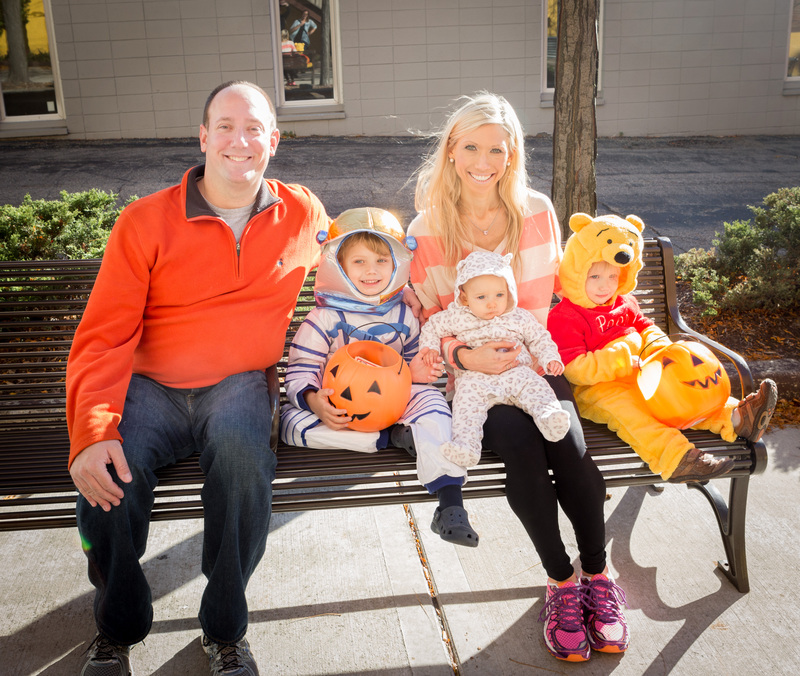 Here are a few pictures from our Halloween adventures and other fun the last two weeks. My inspiration for this recipe came from Food Network’s Pumpkin Bread. While the original version was good, I decided to make a few changes to create the best pumpkin bread ever! I decreased the recipe to make just one loaf, as well as drastically corrected the cooking time. I love the addition of the icing! It really makes this bread something special. This versatile little loaf can be paired with just about anything. I love it for breakfast, as a snack, or even for dessert, with a tall, cold glass of milk. Bake up this Pumpkin Bread with Cream Cheese Frosting to accompany your perfect Thanksgiving dinner, or Christmas morning buffet. Serve it smeared with as much icing as you can, or just a little dollop. Or you can choose to serve it plain, or even with a little pat of butter. However you decide to have it, you won’t be disappointed. Seriously easy, and out of this world fantastic!!! 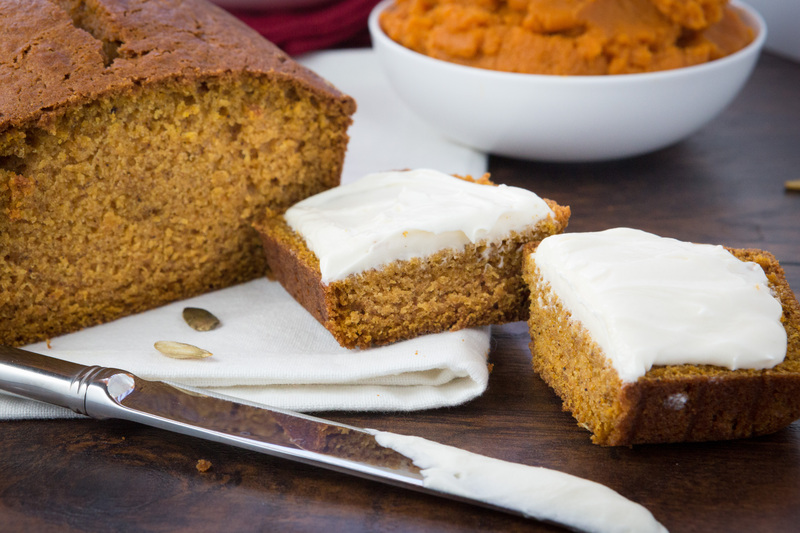 Pumpkin Bread with Cream Cheese Frosting is sure to be a hit for every occasion. Preheat oven to 350 degrees. Butter (or spray with cooking spray) and flour a 9 by 5 inch loaf pan. In a large bowl, whisk together the sugar and oil, then mix in the eggs and pumpkin, and set aside. In a small bowl, add the flour, salt, baking soda, baking powder, cinnamon, nutmeg, allspice, and cloves, and stir together. Gradually add the water, and flour mixture to the pumpkin mixture, slowly adding and stirring in a bit of each at a time. Mix together until smooth, and just combined. Pour batter into prepared loaf pan, and smooth top. Bake for 60-65 minutes, or until a toothpick inserted in the middle comes out with a few crumbs attached. Allow to cool in pan for 10 minutes, then carefully remove from pan and cool on wire rack. To make the frosting, add cream cheese, butter, and vanilla to bowl of electric mixer. Beat on medium speed until smooth, about 1 minute. Turn mixer to low, and gradually add the confectioners sugar, 1/2 cup at a time, then gradually increase speed, and beat together until light and fluffy, 1 to 2 minutes, scraping down the sides as needed. Serve with pumpkin bread. If you’re in the mood for another yummy pumpkin treat, you’ll have to try these Healthy Pumpkin Granola Bars! Creamy, cool, velvety dip that comes together in a flash. 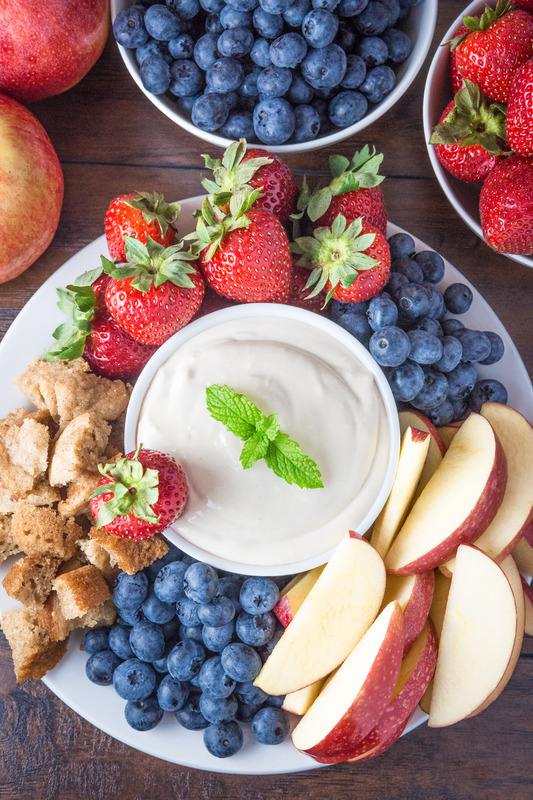 Cream Cheese Fruit Dip is perfectly smooth and delightfully refreshing. This lightly sweetened mix requires just three ingredients and five short minutes. Whip up a batch and experience a great new way to savor your fruit. Happy Labor Day weekend to you and your family! Is it me, or did this summer just fly by? It’s hard to believe that Charlie turned 3 months old yesterday! 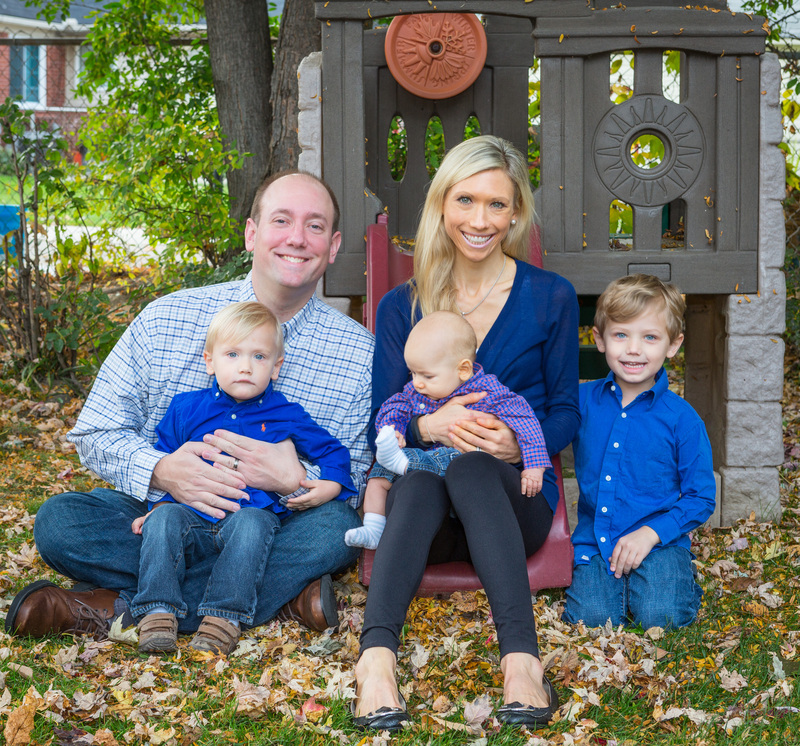 (James is almost 2 1/2 and William is almost 5. Wow! ;)) We kicked off our holiday festivities a bit early, and on Wednesday we headed to Racing for Kids. 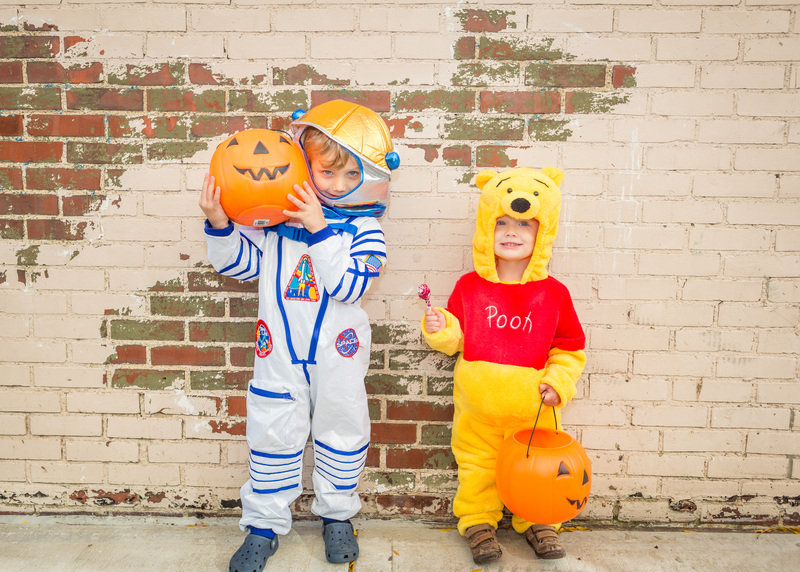 (It’s a fun, local event with tons of cars, activities and treats for kids.) The boys LOVED seeing all of the race cars, especially the ones you could sit in. We even ran into some of our buddies, and found a fire truck, too. It was a blast! At the end of Racing for Kids, there was a special show where one of the drivers demonstrated a burnout with his car. We almost didn’t stay for it, but at the last minute decided to try it. Holy smokes! (Literally 😉 Check out all of the smoke in the last few pictures.) The boys LOVED it and William informed us when we got home, that “the burnout was the best part!”. It was definitely worth seeing! If you need a dynamite recipe for your Labor Day picnic tomorrow, and you’re looking for something speedy, you’re in luck. This dip tastes amazing, and looks beautiful when served up with your favorite summer fruits, cookies, or little cubes of cake. 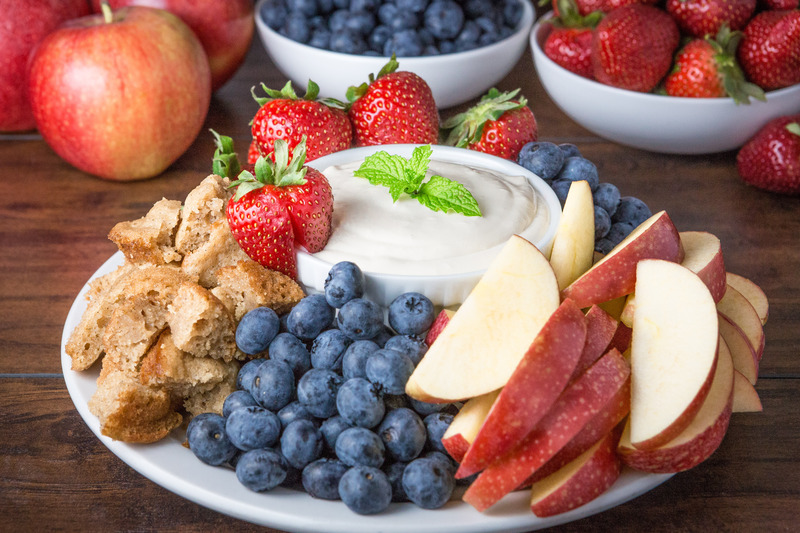 Great as a refreshing snack, or a fun dessert, this Cream Cheese Fruit Dip is sure to be a hit that your friends and family will be raving about. Add cream cheese to a microwave safe bowl and heat for 2 to 2 1/2 minutes, whisking every 30 seconds, until soft and melted. Remove bowl from microwave and whisk vigorously until smooth. Then add syrup and vanilla, and whisk until smooth and creamy, and no lumps remain. Cool to room temperature, then cover and refrigerate for an least one hour before serving. Serve dip chilled, with your favorite fruits, cookies, graham crackers, or cubes of cake. Dip will keep refrigerated for up to 5 days. 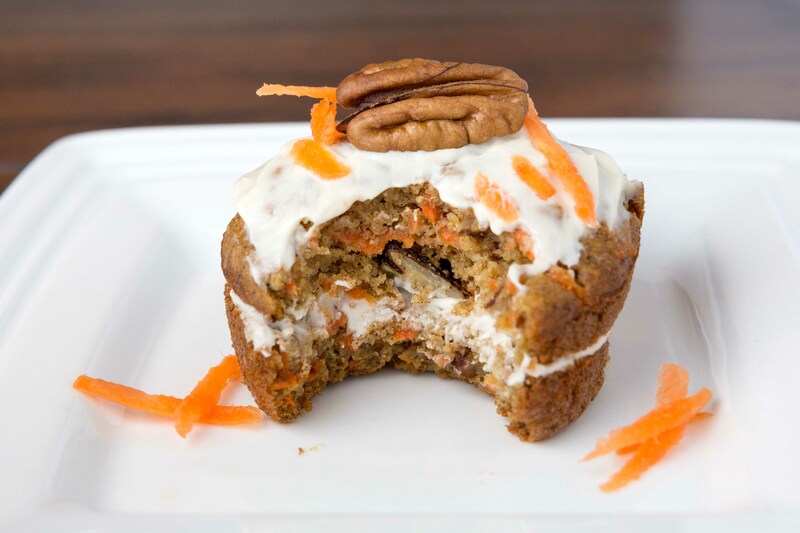 Carrots, oat flour, and spices baked together and topped with a lightly sweetened cream cheese frosting. 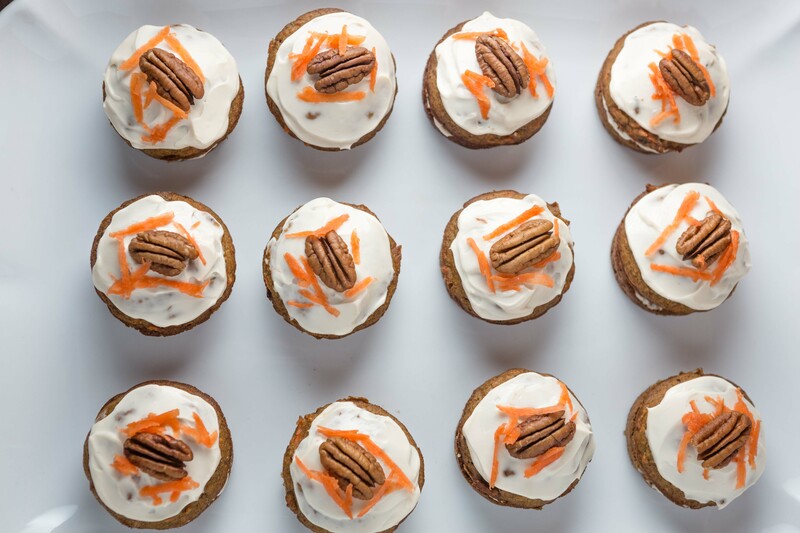 These Good For You Mini Carrot Cakes are the perfect non-guilty way to end your Easter dinner, or are a great dessert or snack any day of the week. I can’t believe Easter is only two weeks away! There is something so festive about carrot cake on Easter. I mean, bunnies, carrots, cake, it’s a winner! So, I figured I would take a crack at trying to create a recipe for a carrot cake that was actually healthy, and that could pass as the “real thing”. I am happy to report: mission accomplished! I mean, it’s about time that the one dessert that actually sounds healthy, finally lives up to its name. The boys and I created these little mini delights the other day when the weather was terrible, and instead of rushing out of the house, I declared it “cooking lesson” time! Both boys grabbed their kitchen stools and their little whisks and spatulas, and stood eagerly at the counter. We added our ingredients and stirred everything together, then baked our first test cake. Once it was done, and cool enough to bite into, we quickly cut into it, and tested away. We tasted it, and decided to add a touch more syrup and a tiny bit more cinnamon, and by the second test batch, it was unanimous. They were perfect! We baked the rest of the little cakes, and could hardly wait until they were done. We each devoured more than our share, and thankfully managed to save a few for Andrew when he got home. 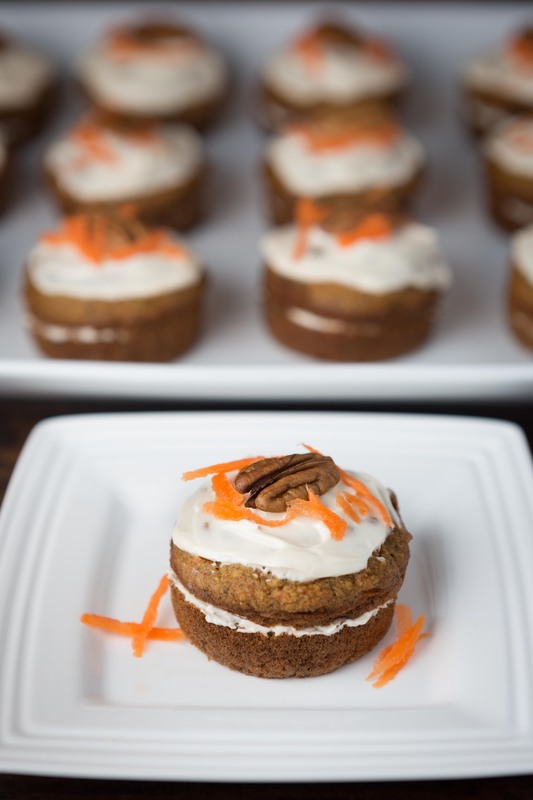 Andrew immediately gave these his stamp of approval, and we all agreed that these little carrot cakes would be on the menu for our Easter dessert! This weekend Andrew was playing around with our little home photo studio and decided to snap a few pictures of the boys. 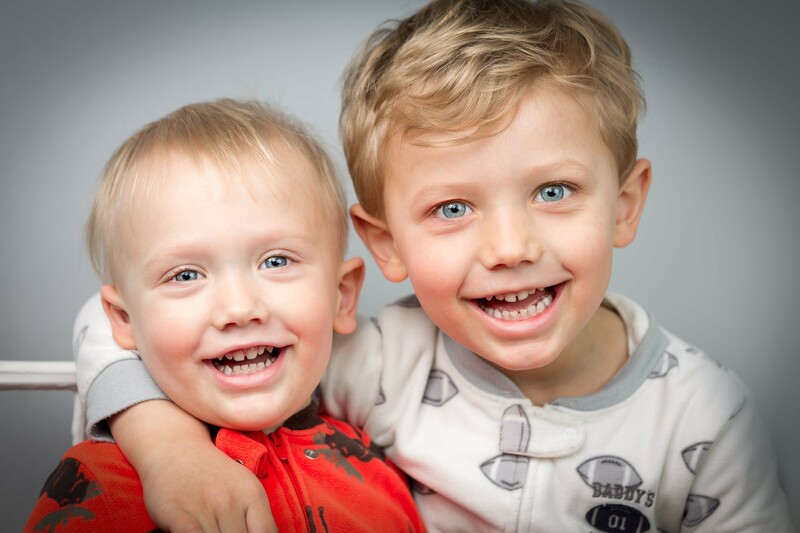 Even though they’re still in their jammies, this has to be one of our new favorite pictures (ever) of these two! In a small bowl, stir together oat flour, baking powder, baking soda, cinnamon, salt and nutmeg, and set aside. In a blender or food processor, puree dates with 1/4 cup warm water. Add to blender: egg whites, apple sauce, yogurt, syrup, oil, and vanilla, and blend until smooth. Pour blended ingredients into a large bowl, and whisk in dry ingredients. Then fold in the carrots and toasted pecans. Spoon batter into a mini-cake pan or regular sized muffin pan coated with non-stick cooking spray. Fill each one about 2/3 of the way full, and bake for 18-20 minutes or until a tooth pick inserted comes out clean. Allow cakes to cool in pan for about 5 minutes, then move to a wire rack to cool completely. Once cool, slice each cake in half, (so you have a top and bottom), and place a small amount of frosting in the middle of each cake, and then replace the top pieces. Using another small amount of frosting, lightly frost the top of each cake. Garnish cakes with one pecan half and tiny amount of freshly grated carrot. Serve and enjoy!